MTO 19.3: Covach, To MOOC or Not To MOOC? I was chosen to teach one of our first MOOCs and based my Coursera courses on the History of Rock class I currently teach at the University of Rochester. Coursera recommends that regular semester courses of twelve or more weeks be broken up into six- to eight-week courses. Accordingly, History of Rock Part 1 runs seven weeks, while History of Rock Part 2 is six weeks in length. The courses are offered consecutively, with Part 2 immediately following Part 1; students electing the sequence thus have a similar experience to those taking the regular semester-length course at Rochester. Coursera has found that students tend not to stick with lectures that extend longer than about fifteen minutes; they strongly recommend breaking up the week’s lectures into a series of shorter videos. Correspondingly, within each week of my courses there are several lectures, each ranging from about five minutes up to fifteen minutes in length, making a total of about ninety minutes of lecture each week. Students can either stream the videos from the Coursera site or download the videos for later viewing offline. Coursera also suggests putting a quick quiz at the end of each of these videos, and perhaps one in the middle as well. I decided to use these quizzes as an opportunity to review the main points of each video rather than test details from the lecture. 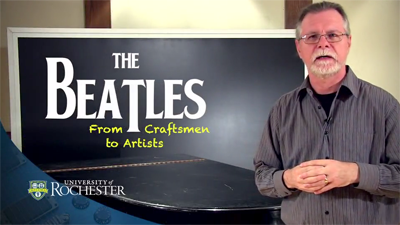 Consider the following video, which is drawn from Week Four of Part 1, “The Beatles and The British Invasion (1964–66).” This video discusses the development of Beatles music from what I call a “craftsman” approach to an “artist” approach. It is the fifth of ten videos from that week of the course. The following quiz appears at the very end of the video, after the lecture has concluded but just before the copyright notices. (6) The correct answers are shown with asterisks. Which of the following statements describe the career of the Beatles and rock authenticity as discussed in the video (mark all that apply)? *The Beatles shifted from an approach that reflected a “craft” in making their music to one increasingly dominated by the “artist” model. The Beatles rejected most of Bob Dylan’s work, finding it pretentious and vague. As you can see, all three responses deal with the most general points made in the video—authenticity, craft to art, and Dylan’s influence. If a student does not answer the question correctly, s/he can try again until the correct answer is submitted or even skip the quiz altogether. These quizzes do not figure into the grade and thus serve only as study aids. Each of the videos that make up both of the courses (sixty-two in Part 1, fifty-four in Part 2) was recorded once and they were done in sequence. I stopped a few times to redo sections, but mostly the lectures were delivered as one would in class—straight through and without stopping. You may notice that I seem to be looking off camera to my left at certain points; I have a music stand just out of the shot containing my lecture notes. As I soon found, the notes had to be much more detailed than the ones I would normally use in class because the video format is far less forgiving of inaccurate data. In class you can admit you’re not sure of a fact and maybe have a student look it up while you lecture; but in the videos it has to be right the first time. From this perspective, the lectures are more like a textbook than a typical in-class teaching presentation. The grades for each course are based on quizzes taken at two-week intervals. These quizzes are automated, with all grading done by the Coursera software and with students able to take each exam up to three times (the highest grade is the one that counts). Students who earn 70% or more of the available points receive a Statement of Accomplishment; those who score 90% or more receive a Statement with distinction. (8) There is a discussion forum for the course; each week I post three questions and students will often pose their own as well. Participation on the forum, however, does not figure into the grade. Though students may receive Statements of Accomplishment, no student earns college credit from Coursera or the University of Rochester. History of Rock Parts 1 and 2 were offered over the summer of 2013 with a combined enrollment of over 70,000. (9) Of those enrolled, approximately 44,000 (63%) participated actively. Video views surpassed one million and downloads topped 600,000 . Most students seem to have watched the videos without taking the exams, or maybe only watched the videos that interested them. Less than 10% of the students participated in the discussion forums, though even that level of engagement created a tremendous amount of traffic on the hundreds of threads. At the conclusion of Part 1 we awarded 4747 Statements of Accomplishment, 1460 of those with distinction; for Part 2 we awarded 3545 Statements, 2978 with distinction.. These numbers are roughly consistent with other Coursera courses. Preparing and teaching this two-course sequence was a lot of work. Simply filming the videos took about 40 hours overall (three hours for each week of the course), while preparing the notes took another 52 hours (four hours for each week). Creating the individual quizzes for each video and the exams required 40 additional hours, with another 26 hours used to monitor the discussion forum and take care of other kinds of online course details. That brings the total time to prepare the course to approximately 158 hours. The video editing and photo research was done by University of Rochester staff, as was a significant portion of the interfacing with Coursera and the course software. (10) These combined tasks add perhaps as much as 300 hours to the total time required to mount a thirteen-week MOOC. Of course, once this work is done, subsequent sections of the course require only a few hours per week of maintenance; the course becomes a bit like a machine that can run almost on its own (or so one hopes). There were some surprises regarding the geographic and demographic data on the students. (13) About 68% of the students resided outside of the United States. (14) About 33% of the students were between the ages of 22 and 29, with another 16% in the 30–39 age range. 35% of the students had already earned a bachelor’s degree; 26% held a master’s and 5% held a doctorate. If those percentages reflect the active students, that would mean that more than half the students are not college undergraduates, and most are not Americans. For those concerned that MOOCs will replace undergraduate college courses in North America, these figures offer some consolation. In terms of gender, 53% of the students were male and 47% female. There are certainly significant pedagogical limitations to the MOOC format, the most obvious being the lack of real-time interaction with students. The format of the testing also makes it very difficult to employ anything other than multiple-choice or fill-in-the-blanks questions. (15) It is possible to have students write papers, and Coursera reports good results with peer-graded papers (the students grade one another). Ultimately it is the sheer number of students that makes it very difficult to replace the traditional college classroom experience with a MOOC, at least when it comes to humanities courses. Add to this that Coursera is what one might call a “free culture,” meaning that the course itself should be as cost-free as possible. This makes requiring a textbook that students must purchase an unpractical option. The future of online education is rapidly developing; what it may look like even a year from now is uncertain. It is clear, however, that online education is not going away, at least not in the United States. Last December, thirteen-year olds all across the country got iPads or some other tablet device as holiday gifts. These young people may not be in our classrooms yet, but in a few years they will be. And when they arrive, they will prefer to work from their handheld device (rather than a textbook) and they will be comfortable absorbing content online. They will be veterans of Facebook, Twitter, Tumblr, Instagram, and whatever else pops up between now and then. They may even hope that college is a series of TED lectures. It’s up to us to be ready for them: love it or hate it, this technology is coming. We are probably wise to own it before it owns us. Berg, Gary A. 2005. “History of Correspondence Instruction.” In Encyclopedia of Distance Learning, Volume 2, ed. Caroline Howard et al., 1006–11. Kolowich, Steve. 2013a. “As MOOC Debate Simmers at San Jose State, American U. Calls a Halt.” The Chronicle of Higher Education, May 9. http://chronicle.com/article/As-MOOC-Debate-Simmers-at-San/139147/. Kolowich, Steve. 2013b. “The Minds Behind the MOOCs.” The Chronicle of Higher Education, August 14. http://chronicle.com/article/The-Professors-Behind-the-MOOC/137905/#id=overview. —————. 2013b. “The Minds Behind the MOOCs.” The Chronicle of Higher Education, August 14. http://chronicle.com/article/The-Professors-Behind-the-MOOC/137905/#id=overview. Kolowich, Steve. 2013c. “Why Professors at San Jose State Won’t Use a Harvard Professor’s MOOC.” The Chronicle of Higher Education, August 14. http://chronicle.com/article/Why-Professors-at-San-Jose/138941/. —————. 2013c. “Why Professors at San Jose State Won’t Use a Harvard Professor’s MOOC.” The Chronicle of Higher Education, August 14. http://chronicle.com/article/Why-Professors-at-San-Jose/138941/. 1. For a history of the correspondence course, see Berg 2005. 2. For an introduction to MOOCs, see “What You Need To Know About MOOCs” in The Chronicle of Higher Education, http://chronicle.com/article/What-You-Need-to-Know-About/133475/. 3. There are, of course, many shades of opinion between these two extremes. Kolowich 2013a gives some idea of how passionate these debates can become. 4. For more about Coursera, see the early notice of this for-profit company’s activities at http://www.marketwire.com/press-release/coursera-secures-16m-from-kleiner-perkins-caufield-byers-new-enterprise-associates-bring-1645322.htm. 5. This is also true of most of the universities currently partnering with Coursera. The issue of whether or not such courses can or will count for college credit is a lively one in academe. It is worth bearing in mind that MOOCs are only one kind of online course. Online courses with smaller enrollments can and have been used to substitute for regular college courses, as did one I taught on rock music at the University of North Carolina at Chapel Hill over ten years ago. Many schools have used online education effectively, including the University of Rochester, which offers non-MOOC courses in several of its professional schools. 6. The quiz formatting is part of the Coursera software and cannot be replicated here. It is worth noting that students who download the videos for viewing later also cannot see these quizzes. 7. Coursera subtitles all lectures in English, while also incorporating a function that slows the video down or speeds it up. The slow-down function, in conjunction with the subtitles, is often used by students for whom English not the primary language; the speed-up function can be used to review lectures before exams. 8. Instructors are able to adjust the numbers of times an exam can be taken, when the exams are due, and how much credit is subtracted for late submissions, as well as many other variables. They may also decide what percentage qualifies a student for the certificates. 9. Almost 43,000 enrolled in Part 1 with about 28,000 in Part 2. Some of those in Part 2 had been in Part 1, but many in Part 2 were new to the course. 10. The videos were edited by Will Graver, who was also in charge of the video shoots. Will had my notes and could thus insert those points into the video. The pictures were researched by Eric Fredericksen, who also took care of much of the interaction with Coursera and with technical online aspects of the course. 11. The remarks that follow may be compared with those of others who have recently developed and taught MOOCs; see Kolowich 2013b. 12. In one post a student explained that his method was to watch each video and stop every time I mentioned a song and listen to it. I probably mention 100 or so songs a week! 13. The following remarks are based on a voluntary survey that students of Part 1 were asked to complete (almost 8000 responses). They are therefore not scientific and may only provide a rough profile of the dimensions discussed here. 14. The three highest represented countries outside the US were Brazil, followed by Spain and India. The forum had discussion rooms for non-English speakers, and these included Spanish, Portuguese, Russian, and Chinese study groups, among others. 15. I often employ approaches that combine multiple-choice and fill-in-the-blank to make the questions demanding without being tricky. 16. We have made the videos for both parts of the History of Rock available on the University of Rochester Institute for Popular Music website (http://www.rochester.edu/popmusic/courses/rock-history-pt-1.html). Colleagues are welcome to use them freely. 17. This approach has been referred to as the “blended approach” and was part of a dispute at San Jose State University regarding the use of MOOC videos from edX, an organization formed by Harvard and MIT (see Kolowich 2013a and 2013c). Using MOOC videos in a blended course that enrolls less than 100 students is not a MOOC, and one can see how categories of online education and resources can become confused and the debate become fractured. For a history of the correspondence course, see Berg 2005. For an introduction to MOOCs, see “What You Need To Know About MOOCs” in The Chronicle of Higher Education, http://chronicle.com/article/What-You-Need-to-Know-About/133475/. There are, of course, many shades of opinion between these two extremes. Kolowich 2013a gives some idea of how passionate these debates can become. For more about Coursera, see the early notice of this for-profit company’s activities at http://www.marketwire.com/press-release/coursera-secures-16m-from-kleiner-perkins-caufield-byers-new-enterprise-associates-bring-1645322.htm. This is also true of most of the universities currently partnering with Coursera. The issue of whether or not such courses can or will count for college credit is a lively one in academe. It is worth bearing in mind that MOOCs are only one kind of online course. Online courses with smaller enrollments can and have been used to substitute for regular college courses, as did one I taught on rock music at the University of North Carolina at Chapel Hill over ten years ago. Many schools have used online education effectively, including the University of Rochester, which offers non-MOOC courses in several of its professional schools. The quiz formatting is part of the Coursera software and cannot be replicated here. It is worth noting that students who download the videos for viewing later also cannot see these quizzes. Coursera subtitles all lectures in English, while also incorporating a function that slows the video down or speeds it up. The slow-down function, in conjunction with the subtitles, is often used by students for whom English not the primary language; the speed-up function can be used to review lectures before exams. Instructors are able to adjust the numbers of times an exam can be taken, when the exams are due, and how much credit is subtracted for late submissions, as well as many other variables. They may also decide what percentage qualifies a student for the certificates. Almost 43,000 enrolled in Part 1 with about 28,000 in Part 2. Some of those in Part 2 had been in Part 1, but many in Part 2 were new to the course. The videos were edited by Will Graver, who was also in charge of the video shoots. Will had my notes and could thus insert those points into the video. The pictures were researched by Eric Fredericksen, who also took care of much of the interaction with Coursera and with technical online aspects of the course. The remarks that follow may be compared with those of others who have recently developed and taught MOOCs; see Kolowich 2013b. In one post a student explained that his method was to watch each video and stop every time I mentioned a song and listen to it. I probably mention 100 or so songs a week! The following remarks are based on a voluntary survey that students of Part 1 were asked to complete (almost 8000 responses). They are therefore not scientific and may only provide a rough profile of the dimensions discussed here. The three highest represented countries outside the US were Brazil, followed by Spain and India. The forum had discussion rooms for non-English speakers, and these included Spanish, Portuguese, Russian, and Chinese study groups, among others. I often employ approaches that combine multiple-choice and fill-in-the-blank to make the questions demanding without being tricky. We have made the videos for both parts of the History of Rock available on the University of Rochester Institute for Popular Music website (http://www.rochester.edu/popmusic/courses/rock-history-pt-1.html). Colleagues are welcome to use them freely. This approach has been referred to as the “blended approach” and was part of a dispute at San Jose State University regarding the use of MOOC videos from edX, an organization formed by Harvard and MIT (see Kolowich 2013a and 2013c). Using MOOC videos in a blended course that enrolls less than 100 students is not a MOOC, and one can see how categories of online education and resources can become confused and the debate become fractured.